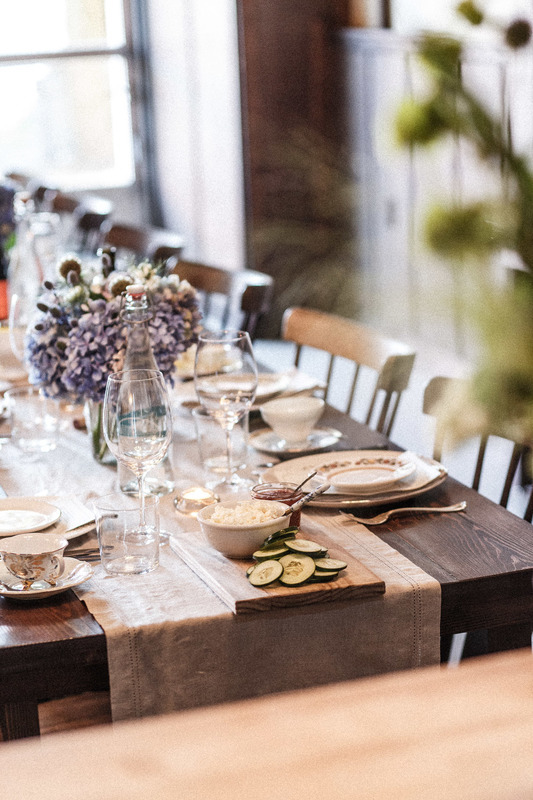 Elder Hall works to connect people and ideas through intimate gatherings around the table. Equipped with a commercial kitchen and a flexible dining room, Elder Hall is perfect for whatever your event entails. 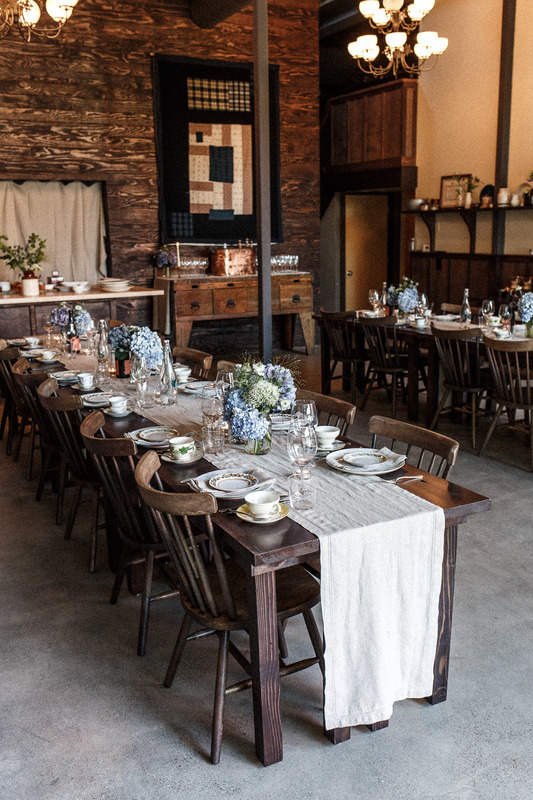 Beautiful wooden farm tables provide communal style dining with windsor-style wood chairs at the tables and on the walls. A beautiful, cedar topped mobile bar allows for a customized bar experience. A large roll-up door provides lots of natural light and can be opened in warm weather months. A Portland made, Beckel tent is available to rent as an extension of the space in warm weather months. Menus are highly seasonal and each one is customized for you and your party. Elder Hall is equipped with WiFi and a Bluetooth enabled sound system. A projector and pop-up projection screen can be rented for meetings and presentations. Elder Hall is available to rent seven days/nights a week, 10am-11pm. Maximum seating capacity is 44; standing is 50; however, the actual capacity will depend on specific event and set-up needs. A nearby parking lot can be rented in the evening for an additional fee. Offering an intimate, inviting space to celebrate life's important occasions is at the heart of what we do. We conceived Elder Hall with the idea of bringing people together to share stories, break bread and make memories. We can't think of any gathering as joyous as a wedding. Because it's a really big deal, we focus on the smallest of details to make your party go off without a hitch. The first thing you'll notice when you step through the doors of Elder Hall is that it feels like walking into a friend's house. Our Shaker-inspired interior is a nod to our hand-crafted ethos in the kitchen. 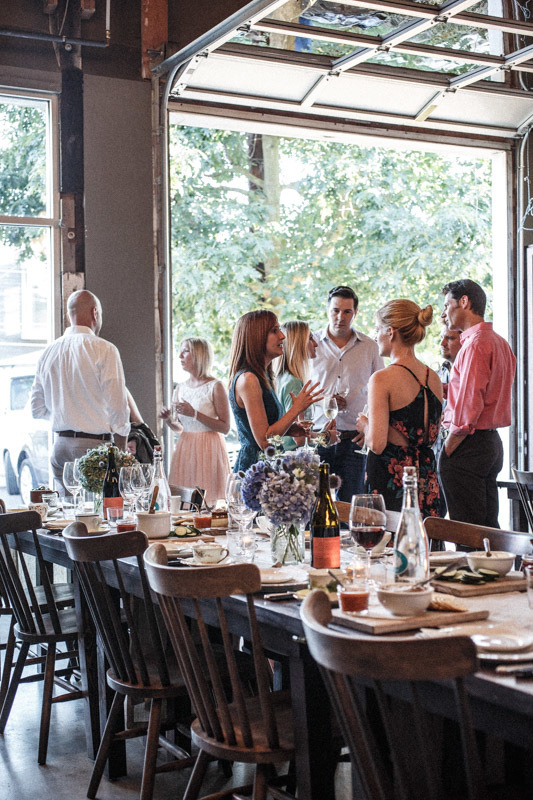 Our tables are communal and we like to serve family-style to give guests more reasons to share and connect with one another. Our roll-up doors offers an extension of the venue where guests can gather in the fresh, open air. Everything we do centers around the kitchen where our culinary team creates menus inspired by the local bounty here in Oregon. Every dish is lovingly prepared and served. We also offer full beverage service and can create a custom cocktail to add another personal touch to your big day. We like to keep things simple and let the warmth of Elder Hall speak for itself. Ammenities such as table runners, candles, local flowers in the summer months and greenery during the holidays are just some of the touches that make events at Elder Hall so special. If you prefer to personalize the venue with your own touches, we're happy to work with your team of vendors. Our Event Coordinator will work with you in establishing your unique event vision and our day-of Event Host will ensure every detail is cared to so that you can relax and enjoy your day. We'd love to chat with you about planning your event or celebration. Contact us here and we can start planning! In addition to private gatherings we can host educational or culinary workshops and cooking classes for smaller groups (typically 20-25 guests or less). It’s a fun, interactive way to spend the day with friends, family or co-workers. Tell us what you're passionate about and let us create a one-of-a-kind event for you and yours.